Alfalfa is a legume primarily harvested as hay and used as animal feed. Its seeds can also be sprouted, making alfalfa sprouts, a common ingredient in fresh sandwiches and salads. 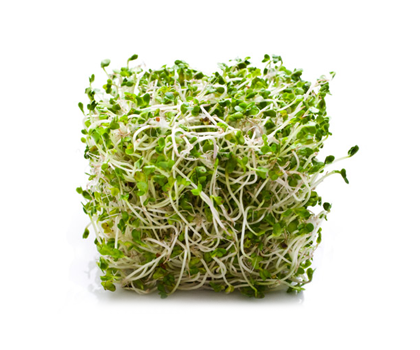 Alfalfa sprouts contain no saturated fat, cholesterol, or sodium. Alfalfa is very low in calories and is a good source of protein, vitamin A, niacin and calcium, and a very good source of dietary fiber, vitamin C, vitamin K, thiamin, riboflavin, folate, pantothenic acid, iron, magnesium, phosphorus, zinc, copper and manganese. Genetically modified alfalfa plants have been available since 2005.